Lovely, modern villa for 11 persons with balconies, terrace, private swimming pool, whirlpool, table tennis and barbecue in the beautiful neighbourhood of Roca Grossa on the Costa Brava. Large, comfortable villa with private pool, barbecue, balcony, terrace, 7 bedrooms, 4 bathrooms, and a fantastic view of the Mediterranean Sea. Nice villa located on a hill what offers you a beautiful view on the sea. Enjoy the swimming pool, sun, and views! Modern villa with 4 bedrooms, parking place and swing for the kids. Accessible for wheelchairs. Beautiful villa for 18 persons with sea view and a fantastic roof terrace, a private pool and barbeque. 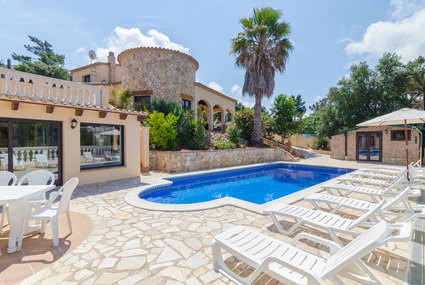 Beautiful holiday villa for six people in a peaceful setting with private salted pool, own garden and situated just 4 km from the beautiful beach of Lloret de Mar. Spacious villa with 2 living rooms, 2 kitchens, sea views, private swimming pool, bbq and ping pong table. 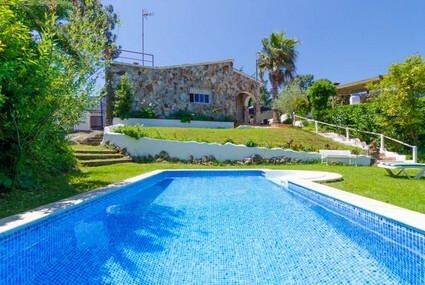 Beautiful child friendly 3-bedroom villa with private swimming pool and sea views. Perfect for spending a lovely and relaxed holiday in Spain!